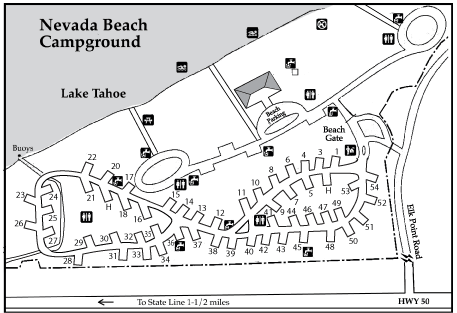 Nevada Beach Campground has some prime real estate on a beautiful sandy shore of Lake Tahoe. Nevada Beach is about a mile long and the widest of Lake Tahoe beaches. The campground has 54 campsites with some among the trees and others with views of the lake. Each campsite has table, food storage locker, fire ring and grill. The campground is open mid-May to mid October. Reservations can be made six months prior to the day of your arrival. Campground amenities include drinking water, flush toilets, and a picnic area with 25 picnic sites. You can also rent paddle boards and grab some food at the concession stand. Outdoor recreation abounds including boating, kayaking, canoeing, fishing, hiking, biking, horseback riding, picnicking, sunbathing, swimming, beach combing and OHV riding. There’s also some plenty of fun stuff for the winter time including downhill skiing, cross-country skiing, snowboarding, snowmobiling and snowman building. D.L. 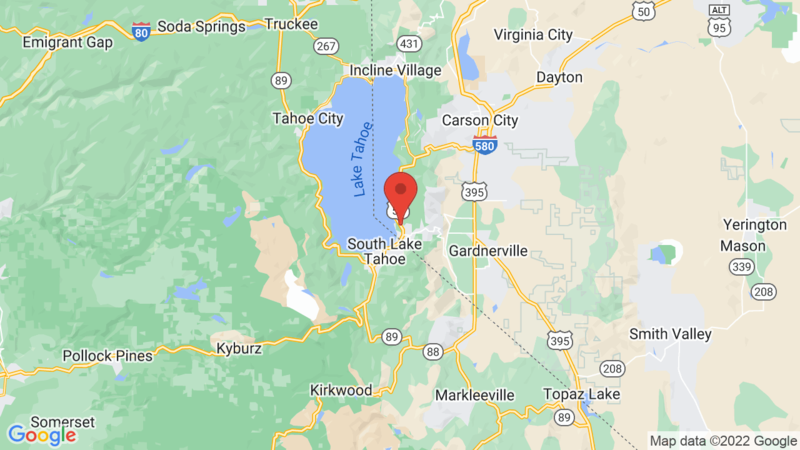 Bliss State Park, Emerald Bay State Park, Meeks Bay and Sugar Pine Point State Park are a few other nice Lake Tahoe campgrounds you may want to check out! Visted Nevada Beach Campground lately? We'd love to hear about your adventure. Did you find us useful? Did we forget something? Anything our community should know before heading out to Nevada Beach? It costs $39 per night to rent a trailer site at Nevada Beach campground. It is a very popular campground and may already booked for the summer. You can go to Recreation.gov to check availability, pricing and make a reservation. How far in advance can you reserve a campsite? Nevada Beach campground is open mid-May to mid October. Reservations can be made six months prior to the day of your arrival. For example, if you’re arriving July 1, the first day you can make reservations is on Jan 1 (8AM PST). We have a link (Make A Reservation) on the Nevada Beach Campground page. Hi, if I wanted to reserve a campsite for July 4th, what would be your recommendation for the best shot of getting a reservation? For Nevada Beach campground, you can make reservations 6 months in advance of the day of arrival. So if you plan on arriving July 1, the first day you could try and make a reservation is January 1 at 10AM EST. Nevada Beach campground will sell out quickly (within minutes) for arrival days around July 4th. I recommend you visit the Nevada Beach campground page about 30 minutes prior to pick out a few sites, then click on the ‘Make A Reservation’ button (about 10 minutes before reservations open) to be routed to Recreation.gov. Choose your site and have everything in the cue ready to go. At exactly at 10AM EST (7AM PST) click on the ‘check availability’ button. If you don’t get your site, quickly check other sites that are available and click on one before they get taken. It’s also a good idea to have a few people trying at once to increase your chances. Good luck! When do you release the availability slots? Nevada Beach Campground opens up reservations 6 months prior to your day of arrival. In other words, if you wanted to start your camping trip on July 10, the first day you could try and make a reservation is on Jan 10. Keep in mind that with the recent partial federal government shutdown, Recreation.gov is advising that reservations may not be honored. That depends on what day you want to arrive at Nevada Beach campground. The reservations are on a 6-month rotating window. For example, if you wanted to arrive on August 1, then the first day reservations open for that day is February 1 at 11am Eastern Time (which is 7am PST time). Best to try and get a reservation as soon as the reservation window opens as Nevada Beach is popular in the summer.